It's already been a decent amount of weeks since I was at Mondial de la bière, but feels like it was just last week (even if it was Canada Day). I'll be paying off the trip for probably the next eighteen months or so but it was worth it. I tried over eighty different new (to me) and made some new friends at the event.. though my memory is a bit *ahem* hazy from the event. The folks over at the Glutenberg/Jukebox/Avant-Garde Artisans Brasseurs table treated me really well over the entire Mondial weekend to the point that I likely spent a quarter of my time chatting with my new friends Renaud and Shawn over at Avant Garde. 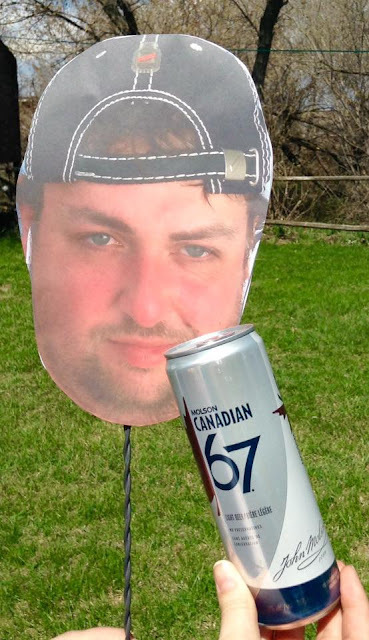 Renaud comes from Bières Jukebox, which I have reviewed back in 2013 with his Distorsion IPA, while Shawn comes from McAuslan Brewing (St Ambroise) as a former assistant brewmaster. Avant Garde brews out of Brasserie et Distillerie Oshlag, which is a contract brewery that happens to be the sister brewery of Glutenberg and seems to consist mostly of former McAuslan staff. Shawn was kind enough to give myself and Hop Citizen a tour a few weeks back and I'll be posting that soon.. but on to the beer! Tonight I'm checking out Perdu dans Malle, Avant Garde's Belgian triple. Perdu dans Malle tops out at 9.1% ABV/39 IBU. Avant Garde has a super serious pairing selection for this beer, including: Belgian fries, Mitraillette, children's parties with clowns or Sunday mass, and with the music of Stromae/Jacques Brel. 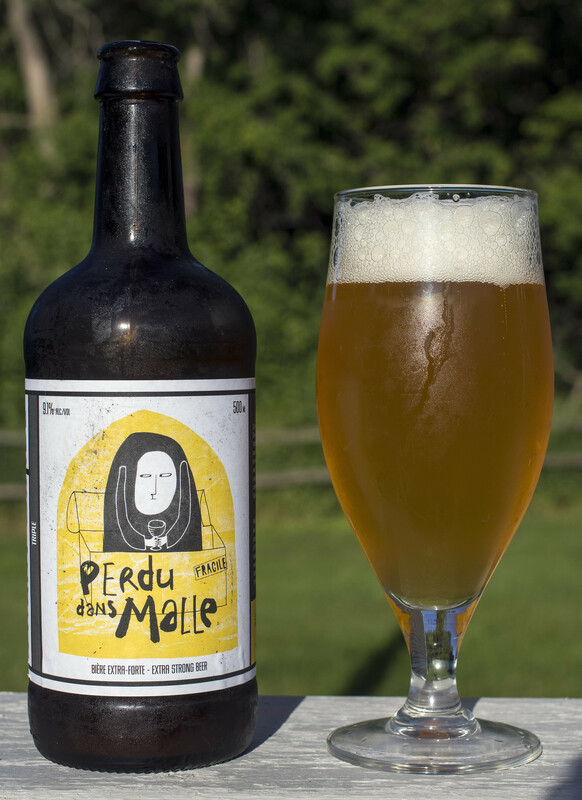 Appearance: Perdu sans Malle pours a moderately cloudy golden ale - For some reason at certain angles it appears as if it is a bit clear.. but it's not. Light amount of carbonation and 1.5 fingers worth of white head that diminishes to mostly residue sticking to the glass or a light amount of skim on top of the beer. Aroma: This is a citrus-forward Belgian triple that has a good presence of bitter hoppiness - a bit of a pine and dill aroma to it. Notes of bubble gum, lemon, grass and a light amount of spice. Taste: I'm a bit surprised that this is 9.1% as it's not boozy at all.. Rather, it's crisp, citrusy (lemon) and decently bitter. For some reason I was thinking "hmm.. this has a decent amount of dill like as if it has Sorachi Ace hops to it". Well.. 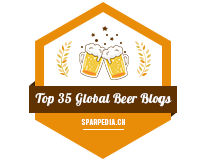 I just checked on the website and it does have Sorachi Ace hops in it! That makes me excited as I haven't had a Sorachi Ace hopped beer in three or four years at this point. 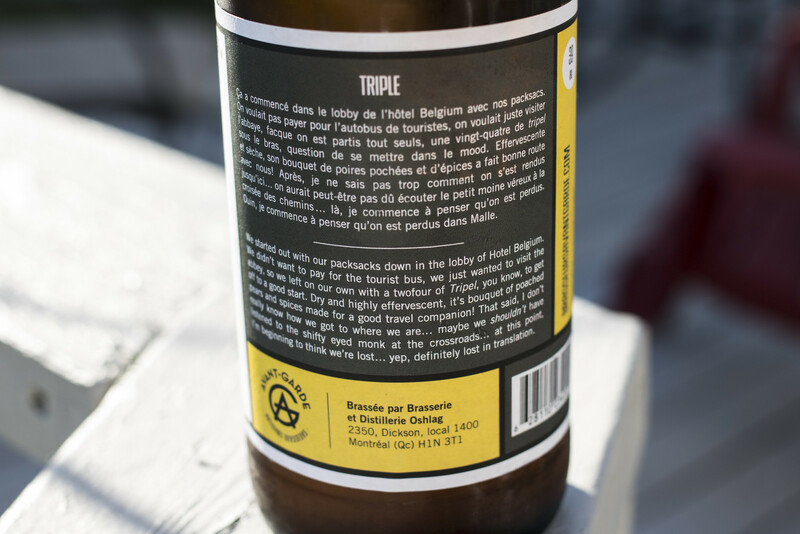 It's sweet, a tad yeasty, grassy and pretty much reminiscent of your typical Belgian triple. Hint of pear popping out at the very end. Overall Thoughts: I'm surprised by the hop presence in here.. not because of the whole Sorachi Ace aspect of the beer.. but because it's decently more bitter than most Belgian triples I drink (which I drink a lot of). I AM even more surprised that it uses Sorachi Ace hops though, it's an under represented hop in beer and it works really well in Belgian styles of beers. Good amount of hops, mildly citrusy, lightly yeasty/bready and overall delicious Belgian triple - Shawn and Renaud have an awesome beer on their hands... I just wish I could find it in Manitoba. Stay tuned for my upcoming blog entry on my visit to Oshlag/Glutenberg thanks to Shawn!